On “Sanctuary Cities”… A lot of people have been asking questions about our discussion on whether Iowa City should formally adopt the “Sanctuary City” designation as a response to the President-Elect’s campaign promises relating to immigration enforcement… So I thought I would offer my own views, and in doing so, I am not representing city policy nor am I making a prediction about the choice we make tomorrow at our work session. 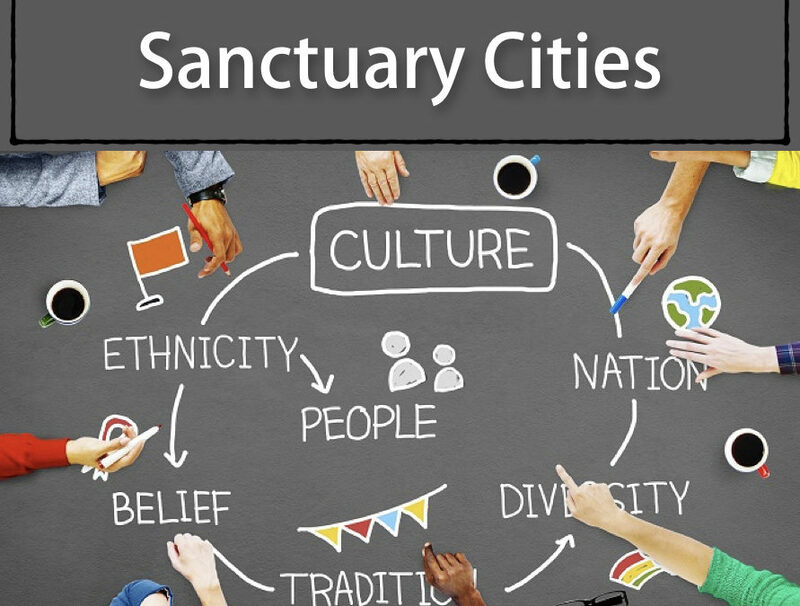 (First a clarification… We are not officially voting on any resolution to make our a city a Sanctuary City. So there will be no public comment during the formal meeting, unless you choose to comment during our community comment period. Brothers and Sisters, this is going to be one of the biggest issues that we address because it strikes at the very core of who we are as as a city and what we value. That we must stand with one voice in solidarity with our friends and neighbors who come to our city from throughout the world regardless of whether they have a passport stamp. That we must vigorously oppose and contest any efforts to engage in mass roundups, or coordinated large scale raids whose sole purpose is to terrorize and intimidate people trying to feed their families. We will do everything in our power to stop such raids, and instruct our legal staff to vigorously context any such order from the federal government. That we must choose to exercise our discretion consistently with community safety. That means our officers will continue to cooperate with all crime victims, and will continue to certify any requests to obtain status by victims of domestic violence, or any other violent crime. But this doesn’t means that, as the robo-callers have suggested, that this is some kind of get out of jail card if you’re an immigrant. They like, any American citizen, are subject to the same rules and penalties as anyone else who violates state law. We have a duty to honor judicial warrants. We cannot, without significant damage to the rule of law, refuse to follow warrants issued by a judge after a peace officer has filed a sworn affidavit stating with particularity the crime alleged, and the person’s connection to that violation, but neither can we refuse to honor a warrant against any citizen, or lawful resident. In so doing, we are merely upholding a time honored precedent from the warrant requirement of the 4th Amendment and the Equal Protection Clause of the 14th Amendment by ensuring that persons under law are not treated differently based upon national origin. Finally, the enforcing versus not enforcing the law is a GIANT RED HERRING. They cannot command state officials to hold people in jails beyond the lawful expiration of their sentence without a warrant based upon probable cause signed by a judge. That is the law as found by multiple federal courts. Under our Constitutional system, the rules relating to Immigration and Naturalization are exclusively a federal prerogative. States have very little inherent authority over immigration enforcement. That is the law. Federal law entrusts state and local officials to certify that certain victims of violence crime have cooperated with law enforcement. If they do that, that is the first step to obtain status. That was implemented to encourage crime victims to report violence crime. That is the law. So what it really comes down to is a choice about how and whether we wish to exercise our discretion, ie the power as a municipality that we do possess under our state law to refuse to cooperate with voluntary federal initiatives. I was taught growing up when a stranger comes to your door asking for help, that you don’t ask them for a passport stamp first. You act consistently with your values and respond to a person in need. But the issue here is even more compelling because it involves not strangers, but our friends, our neighbors, our family members, and our valued community members. We will never turn out back on those law abiding residents, and will ALWAYS stand with them. ALWAYS. So tomorrow, I will seeking to do just that. D. Finally, that we encourage a group of community stake holders to address possible policy changes to ensure that all members of this community feel that they belong, regardless of their national origin. This task force may include, members of outside organizations, who have specialized expertise in federal immigration law. As for the label “Sanctuary”? I am more interested in substance over form. I see no reason to unnecessarily compromise our right to important federal housing assistance if we can achieve the same result without that label. But if push comes to shove, and we are asked to make that choice, I will always choose the well being of community members over a bag of coins from the federal government. And no amount of robo-callers, or threatening communications will change that view!!! The above article was taken from a Facebook Post by Rockne on 2 January 2017 at 7:18 PM CT.